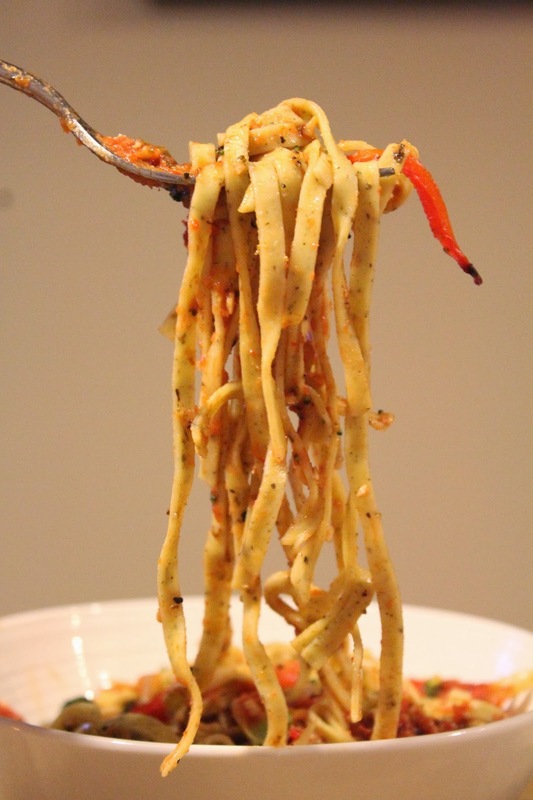 Question: What would life be without hot bowls of savory, saucy pasta? Don’t worry. We won’t even discuss the next level of sadness which involves a life lacking of hot bowls of pasta and red wine. 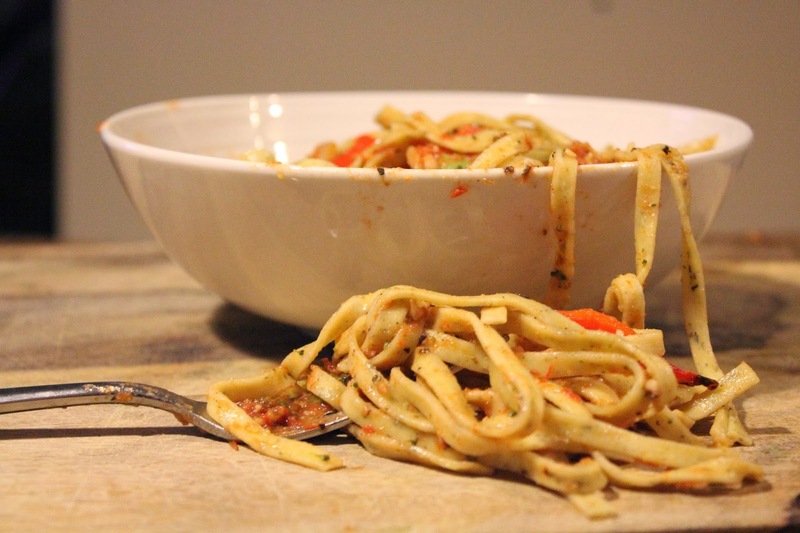 I trust you have most of the ingredients for this pasta primavera already in your cabinet and fridge, and you most definitely already have a bottle of red wine laying around too. If not, substitutions are easy enough. Do what you need to do. Sadness isn’t even in your vocabulary today. Did you realize February is the last full month of winter before the seasons change and Spring’s flowery warmth fills the air? It’s true. Springtime is just around the corner. You can make it! WE can make it! 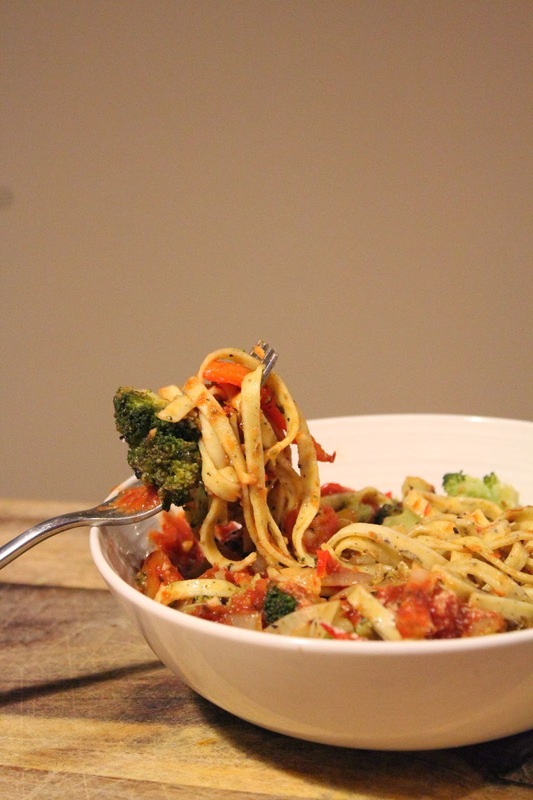 While we wait for the cold to pass (don’t hate me for calling mid-50’s cold), we can fill our bellies with comforting pasta noodles and steamy healthy vegetables for good measure. As much as I love pasta and Italian cuisine in general, I don’t/can’t eat it often. 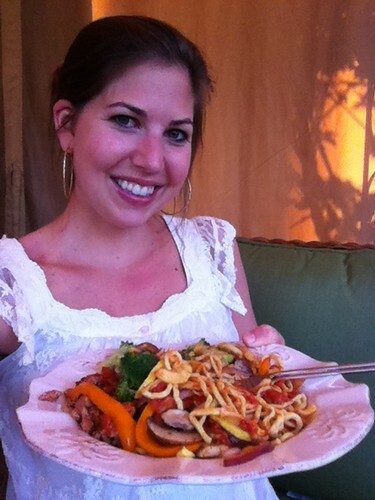 Portion control is virtually impossible when it comes to eating Italian dishes at a restaurant. Even when making it at home, it’s easy to chomp down on more than a single serving size of noodles. So. delicious. I end up avoiding it altogether to spare myself over-indulgence on a regular basis. I don’t always drink beer, but when I do, I prefer Dos Equis. 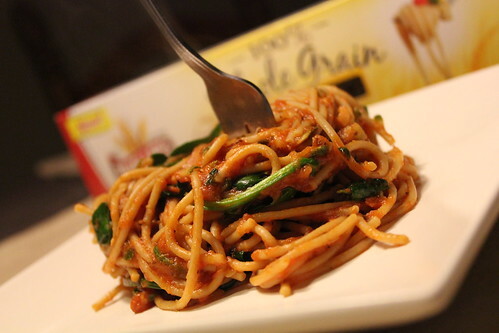 I don’t always eat pasta, but when I do, I close my eyes, let out an “mmmmm”, savor every bite, and dream of Italy. One day I will go to Italy. Have you been? Yes? Oh. I’m a tiny bit jealous. This is one dreamy, happy bowl of pasta. Winter blues can get lost. 3. 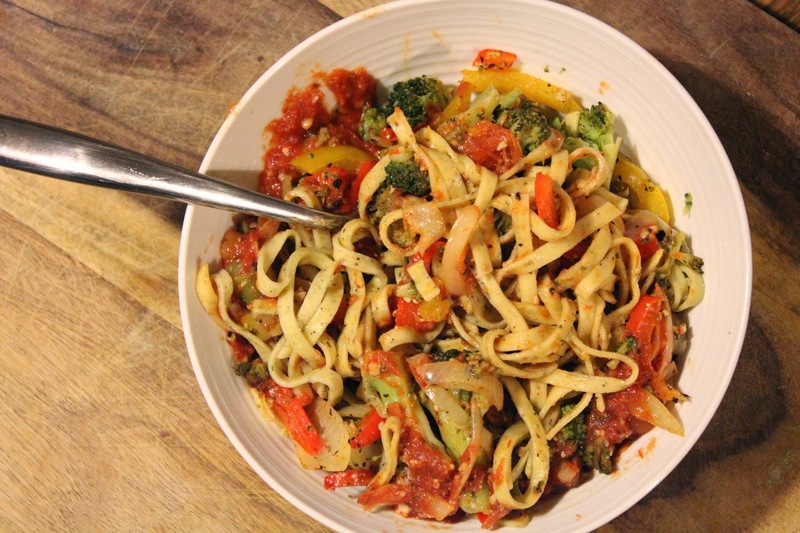 While pasta is cooking, add bell pepper, broccoli, onion, tomato, and garlic to a large cookie sheet lined with foil. Drizzle with olive oil. In a small bowl, combine salt, pepper, cayenne pepper and Italian blend seasoning(s). Mix well and sprinkle evenly over the vegetables. Cover pan with foil and roast in the over for about 30 minutes, stopping half way through to give veggies a gentle stir. 4. In a medium saucepan, add marinara sauce, Sriracha and red pepper flakes. Place on stove top over medium-low heat. Cook until sauce beings to simmer. 5. 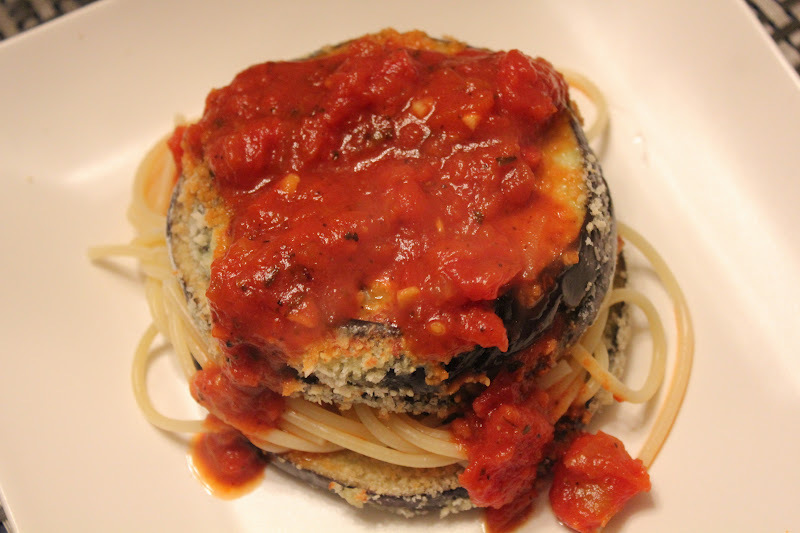 To serve, add about 1 cup of noodles to a bowl, top with about 1/2 cup of the roasted vegetables, and 1/2 cup of sauce. Sprinkle with with shaved Parmesan if desired. Stir everything up and enjoy! This past weekend I flew to Columbus for one of my best friend’s weddings. Between taking off a lot of work for Greg and I’s wedding/honeymoon earlier this year, and still a few more out of town weddings in the coming weeks, we’ve had to strategize our vacation time. That meant Greg stuck behind in Charleston while I made the quick weekend trip. I wasn’t even in Columbus for 48 hours, so I had to make the most of my time. After my brother Austin picked me up from the airport around noon on Friday, we headed straight to Chipotle for lunch. Mmm, mmm. We do have one Chipotle in Charleston now (technically North Charleston), but it’s not the most convenient. I make the trip occasionally, but not often enough. Chipotles are all over Columbus so it’s a frequent stop when I’m there. 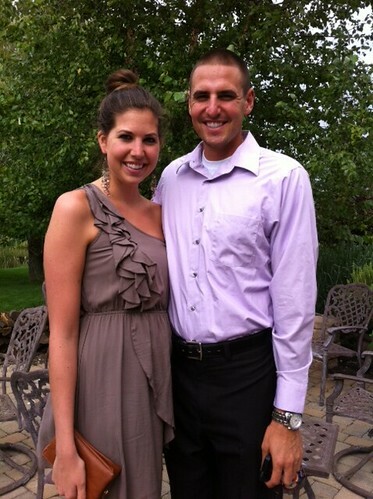 After catching up with my mom and lounging around her house with Austin, we got dressed up and headed to the wedding. Being only about a year and a half apart in age, Austin and I have always been super close. If Greg couldn’t be my date, Austin made a great stand-in. 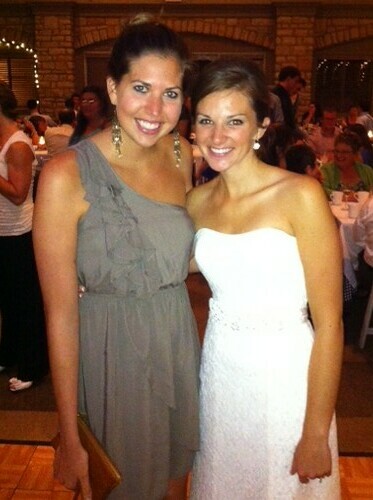 And later at the reception, I was finally reunited with the beautiful bride! I couldn’t get over how gorgeous and happy Alyssa looked. I also couldn’t believe it had been three years since I last saw her. Congratulations Alyssa and Mark! Unfortunately, I didn’t get a chance to grab a cupcake at the wedding. So I (easily) convinced Austin to stop for ice cream on the way home. 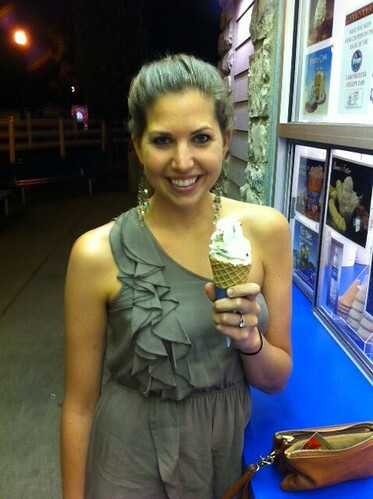 Chocolate chip cookie dough in a waffle cone for me! Saturday morning started bright and early at the gym with Austin, followed by a run with my step-dad and his and my mom’s two border collies. I had plans to meet up with Diane at Northstar, but unfortunately we weren’t able to make it happen (next time, Diane!!). 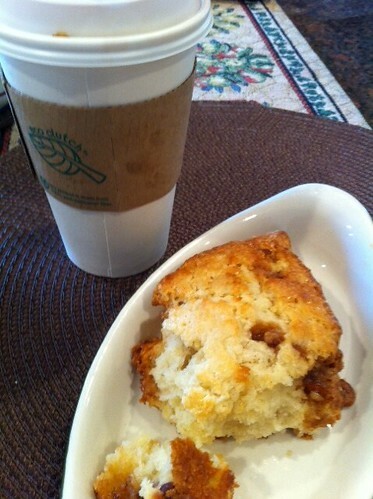 Although we couldn’t go together, I was determined to get my fix while in town, so stopped by for a praline scone and coffee to-go on my way to my grandparents’ house. It was an amazing day filled with nothing but family time…and more delicious food. My step-dad picked up fresh pasta and marinara sauce from a local Italian restaurant. He’s friends with the restaurant owner (and has been for many years), so we were hooked up with the best stuff. Thom cooked us all pasta primavera, full of peppers, onion, broccoli, mushrooms, squash and garlic. Seriously, to die for. 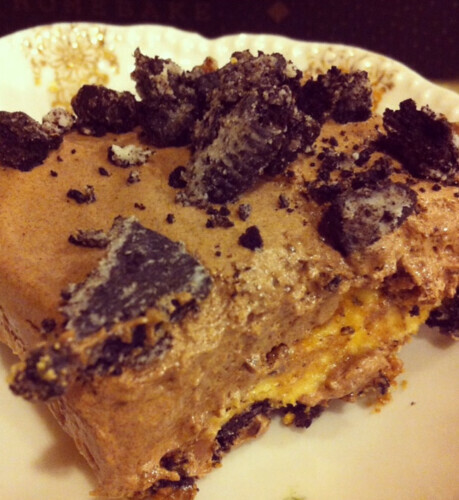 I added sweetness to the night by making a rich and decadent dessert. I don’t know what you call it, but I’ll tell you the star ingredients: Chocolate, peanut butter, Reese’s cups and Oreos. Can you ask for anything more? By Sunday, it was time to get back to clean eating. My flight home to Charleston brought me through LaGuardia Airport (so random), but was pleasantly surprised to find a salad bar in the food court. I loved it and I love whoever was in charge of making an airport salad bar happen. I arrived home in the afternoon, shortly before Greg received a very exciting phone call. I haven’t talked much about it, but we had put an offer in on a house. Andddddd….the sellers accepted our offer! Although it’s not technically official, I can confidently say we will be moving into our first house next month! With the help of some healthy whole grain carbs, you’re about to feel much, much better about this week. I mean, come on. How could you not feel better with some of this in your life. I’m about to eat my computer screen just looking at this again. Look what happens when you twirl a bite of pasta out from the center of your plate. You get a spaghetti wreath! Cute, right? Now that will put a smile on your face. No? Just me? Okay. 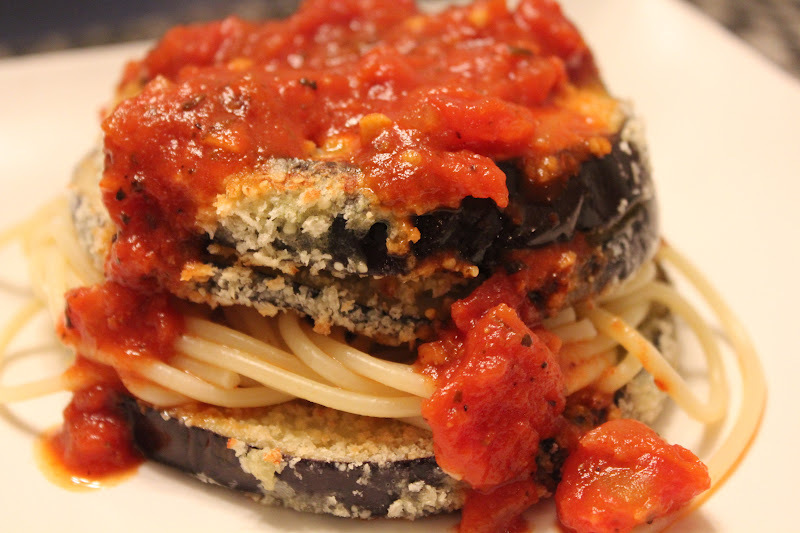 Bread, pasta and carbs in general have developed a bad reputation among many Americans these days. But like everything in life, moderation is key. There is nothing wrong with a bowl of pasta every once in awhile, so I don’t know why I feel the need to justify it right now. 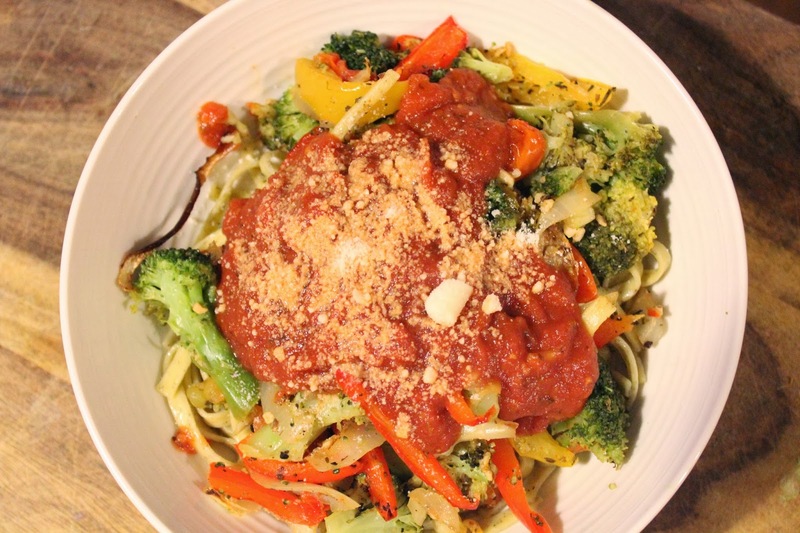 But I just want to say that by adding some veggies to the dish, it can be just as healthful a meal as any, especially if you use whole grain noodles. 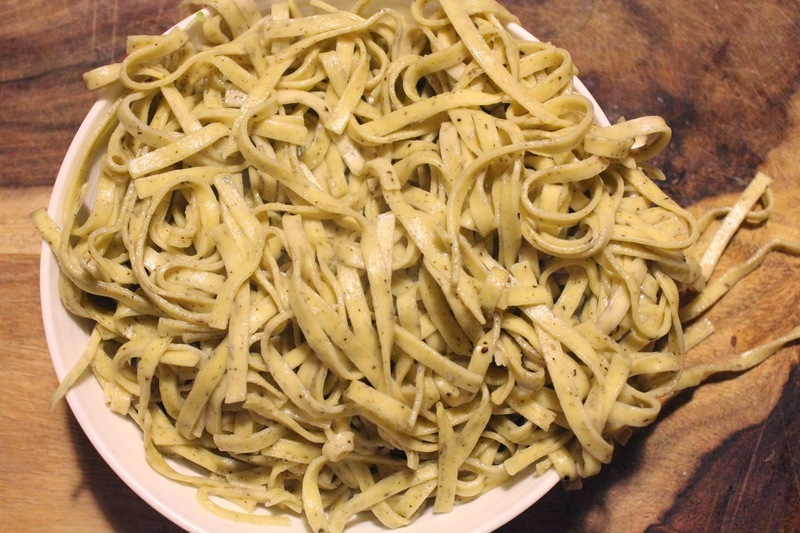 Today I give you permission, in fact I urge you, to make yourself a bowl of hot, steamy pasta and savor every last healthy bite. 2. Meanwhile, add olive oil to large skillet and place on stovetop over medium heat. When hot, add shredded zucchini and sliced onion. Saute until vegetables become tender and brown, about 4-5 minutes. Add marinara sauce and spices to the skillet and stir. Cook 2-3 minutes, then turn heat down to low. 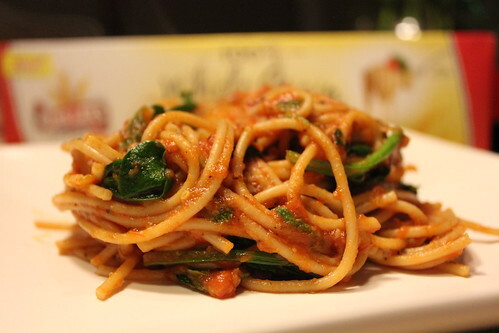 Add spinach and pasta to the skillet. Toss everything to evenly coat with the sauce. Let cook 2-3 more minutes, until spinach just begins to wilt. Remove from heat and serve immediately. 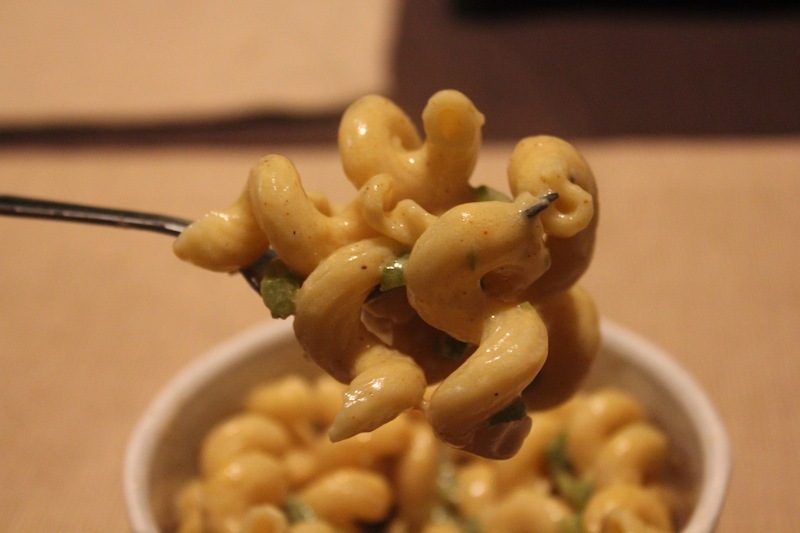 Mac and cheese, ma-mac and cheese. Uh! Can I have some please? Please tell me you know what I’m talking about. You know, that Verizon commercial? I don’t see it on much anymore, but that song was my jam back in the summer. I could sing that song all day long while eating (or even just dreaming) about a bowl of this. Super spicy. Super creamy. Super delicious. Need I say more? Well I’m going to anyway. You need to make this. 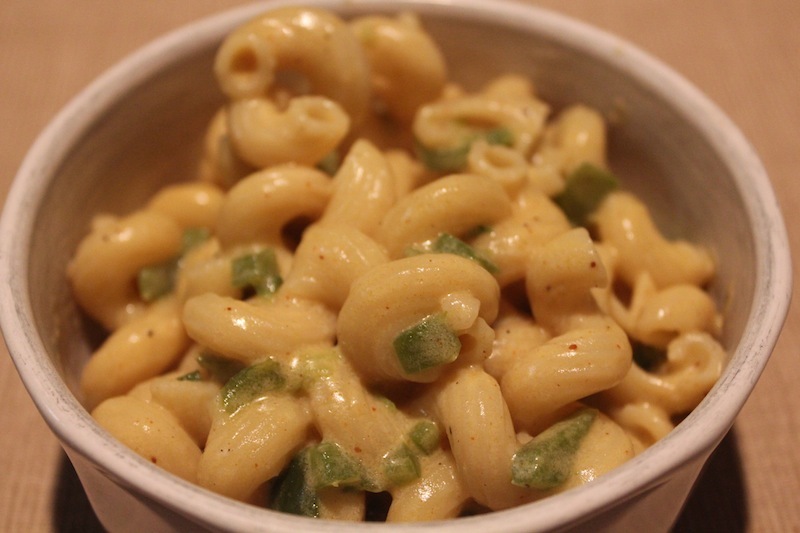 And if you have never made homemade mac and cheese before, just do it. (I’m a Nike rep now by the way….ok not really). 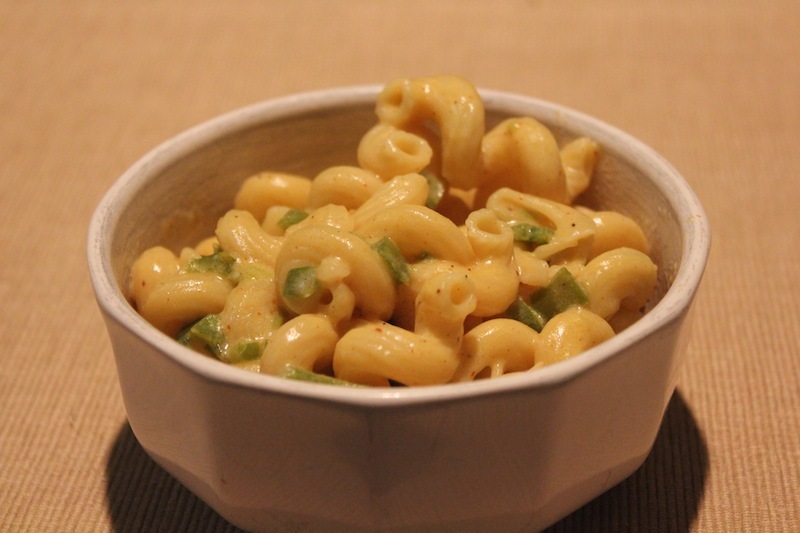 But this was my first homemade mac and cheese experience too and I promise it’s easy peasey, nice and cheesey! I know I’m all over the place today. Sorry. 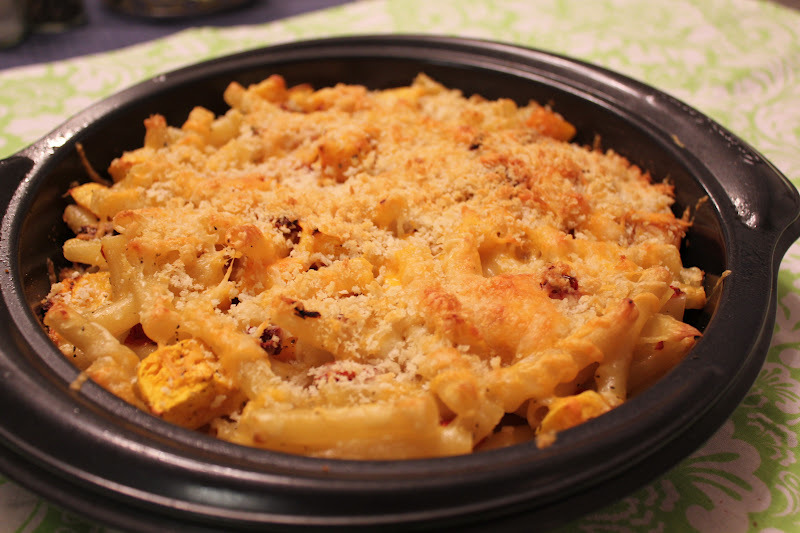 I don’t know if it’s the Christmas music making me giddy, or the taste of this mac and cheese still lingering on my tongue. Probably a combination of both. I’m just going to stop while I’m ahead. 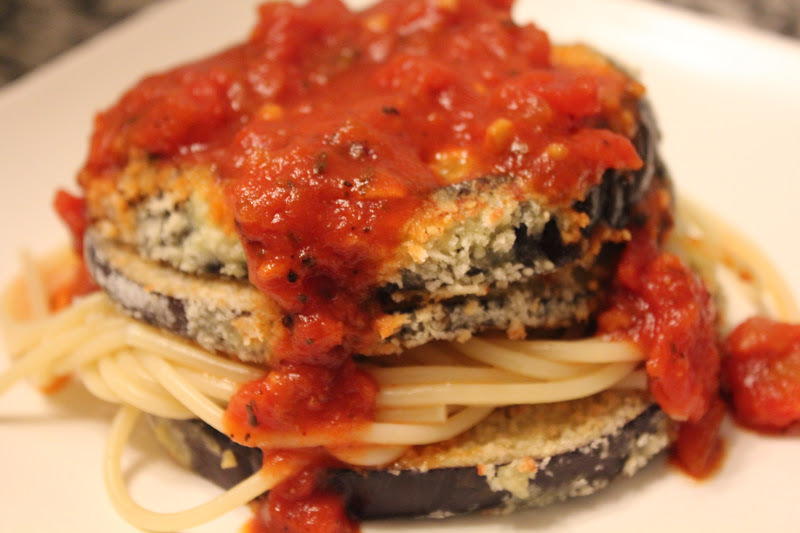 Here’s the recipe…Enjoy! 2. In a large saucepan, melt butter over medium heat. Add bell pepper, jalapeno and garlic. Cook about 4-5 minutes or until vegetables become tender and begin to brown. Add milk and bring to a simmer, whisking occasionally. Add flour and continue whisking for about 3 minutes. Add cheese to pot and stir until completely melted. Turn heat to low and allow to simmer. Add remaining seasonings. 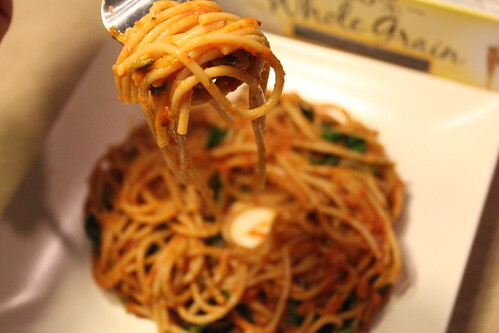 Pour cooked pasta into the pot and toss everything to coat the noodles. Serve immediately. 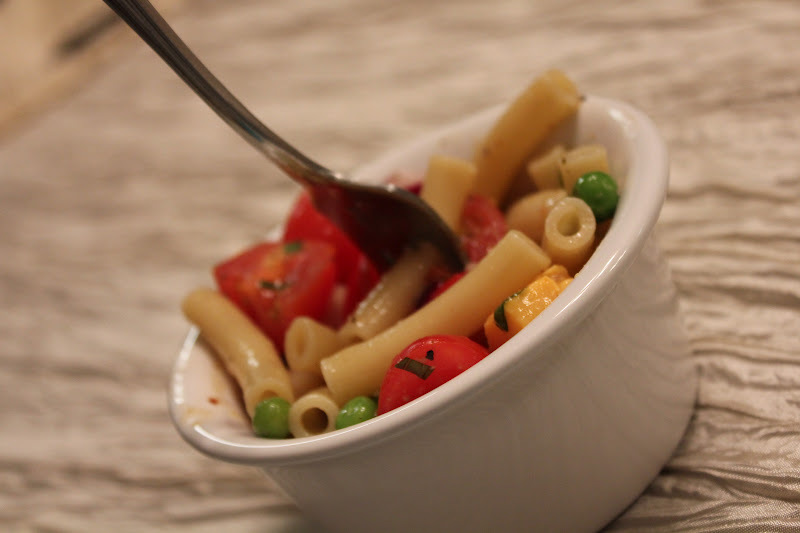 A big bowl of chilled pasta salad is a must in the hot summer months. 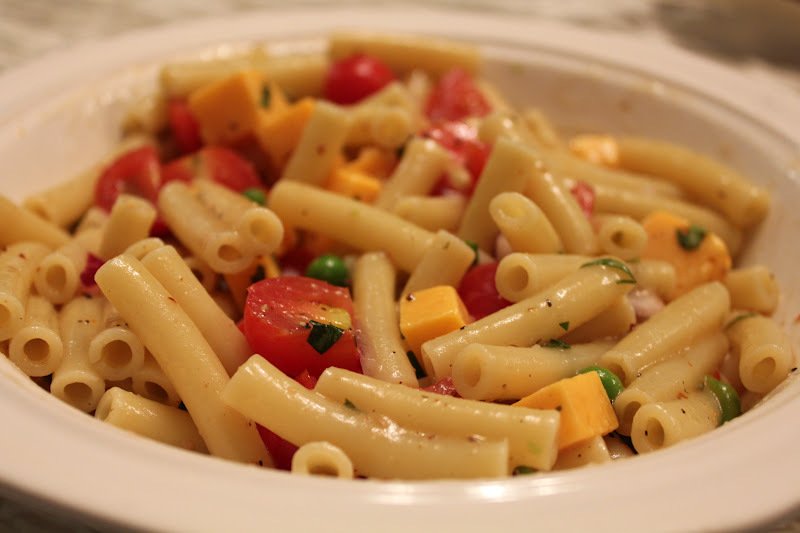 This isn’t the first Italian pasta salad recipe I’ve posted, and it probably won’t be my last. 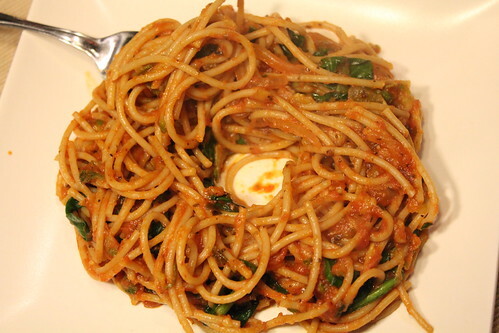 I am a pasta-loving girl. Really, I am a carb-loving girl in general. I have learned to be more careful about consuming so many carbs ever since I quit the swim team in college and haven’t been burning nearly as many calories as I once did. 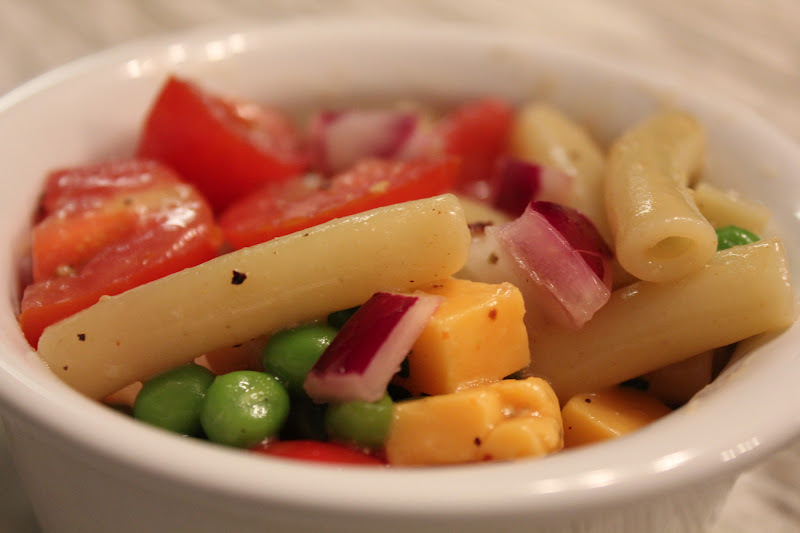 Pasta salads like this one allow me to get my pasta/carb fix while still fitting in tons of healthy vegetables. Win-win! 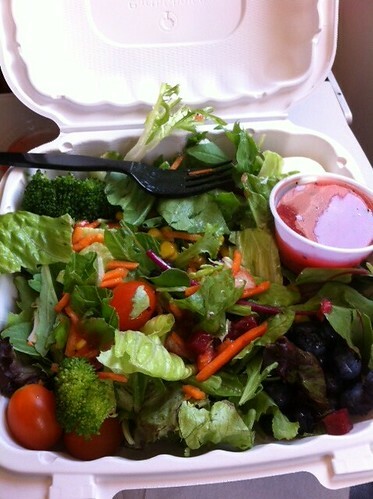 I love a bright colorful meal, don’t you? 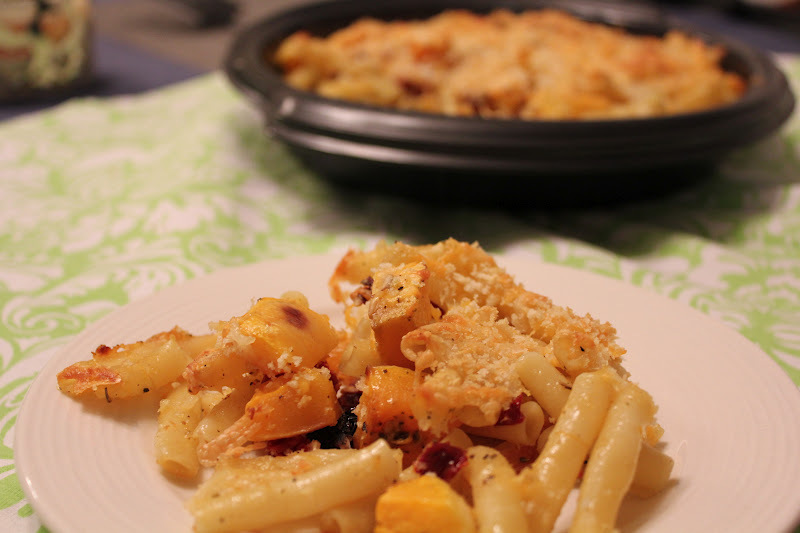 This recipe is similar to my other pasta salad, but I scaled it down a bit to better fit my table for two. I also used some different vegetables and cheese. 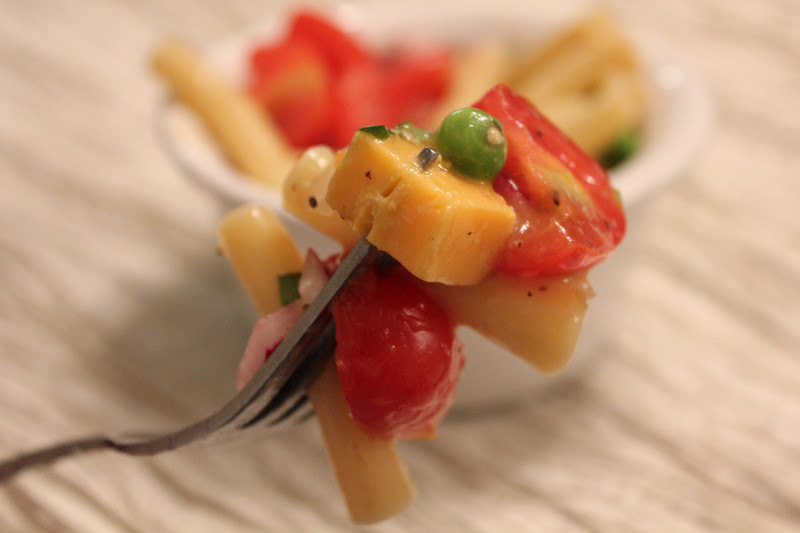 I am always looking for new ideas for pasta salads so please share your favorite things to mix into yours! 1. Bring a large pot of water to a boil. Meanwhile, prepare vegetables and cheese by chopping as necessary. 2. Add pasta to boiling water and cook according to package directions (about 8-10 minutes). Drain and rinse in cold water. 3. 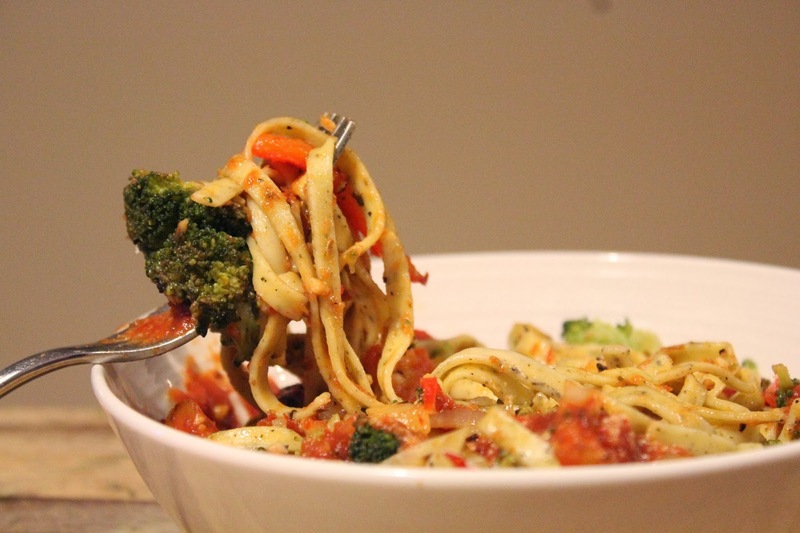 Pour pasta in large bowl along with the vegetables, cheese, and basil. Stir to mix well. Add Italian dressing and gently stir to distribute evenly. Friday, Friday, Friday. The day I have been waiting for since Monday (…Monday, Monday). What else is new, right? I’m pretty sure I say this every week, but what can I say. I love my weekends. I have a busy couple of weekends in a row starting today, with a week-long Caribbean vacation thrown into the mix in just about two weeks. Ahhhhhhhh! So besides daydreaming about the trip, I’ve been in the kitchen whipping up a lot of new recipes this week too. I’ve already showed you the sweeter things – cookies! But I made a savory dinner to keep everything balanced. I bought my first butternut squash at the Daniel Island Farmers’ Market last week and spent a good three or four days brainstorming the best way to use it. I finally decided on a pasta bake. I researched a few recipes, but in the end came up with my own concoction. The version I made could have used more cheese, but I was trying to keep it as healthy as possible. So if you want to use this recipe, just make note of that. Otherwise it was great, especially with a side of steamed broccoli florets on the side that I ended up mixing right into the pasta. 2. While squash is baking, boil pasta according to package directions. Drain and return to pot. Add butter and 1/4 cup shredded cheese. Stir until butter and cheese is melted. 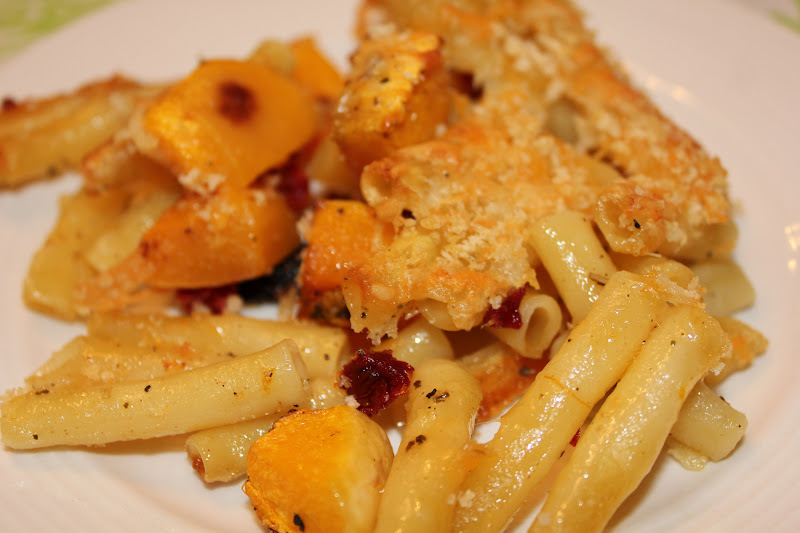 Add butternut squash and stir again to evenly distribute. 3. 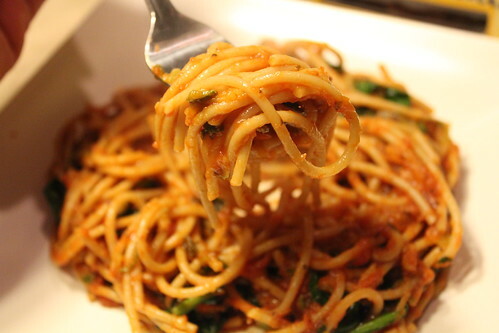 Pour pasta into 9-inch pan. 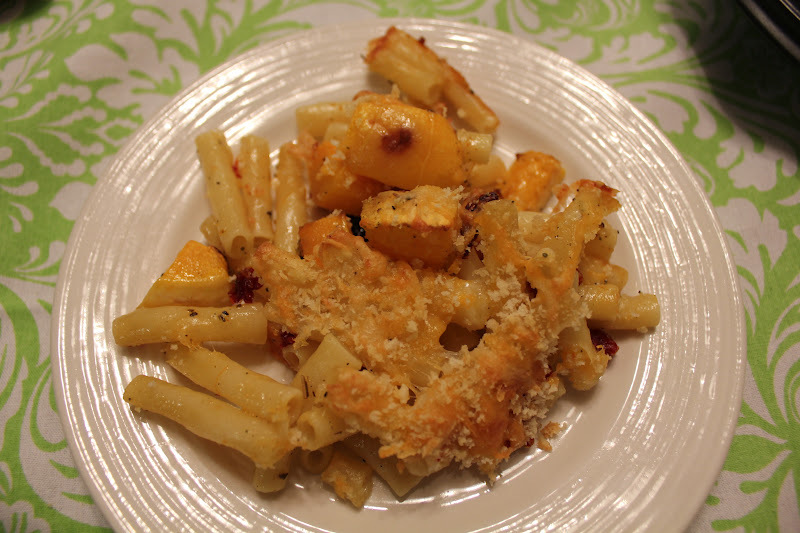 Top with remaining 3/4 cup cheese, followed by breadcrumbs. 4. Bake for 15-20 minutes, or until breadcrumbs become golden brown.